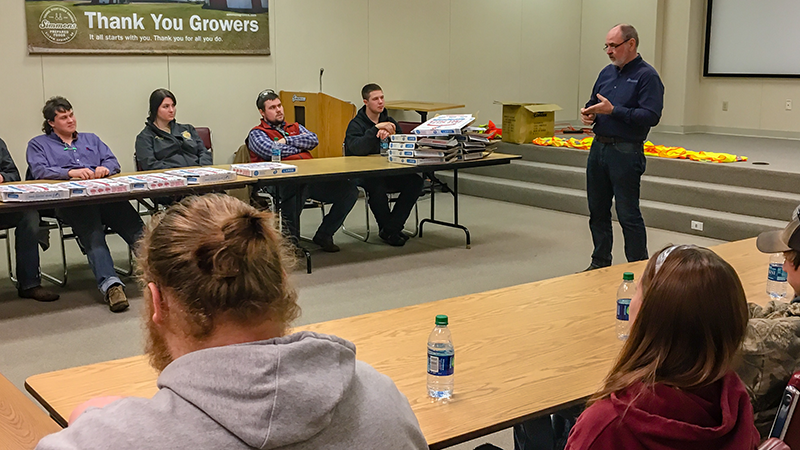 CASS students recently stepped outside the classroom to better understand how the skills they are learning are essential to companies like Simmons Foods when it comes to keeping operations running smoothly and efficiently. CASS, which stands for the Career Academy of Siloam Springs, has an ongoing partnership with Simmons’ engineering and maintenance teams that includes regularly scheduled visits to Simmons operations facilities. During their most recent visit on March 6, 17 students in the CASS Industrial Maintenance Technology program toured Simmons’ existing Decatur Processing Facility, the Decatur Feed Mill, and the new facility currently under construction in Benton County. Before touring the facilities, the students were given an overview of what Simmons does and learned of the five core values, including a strong emphasis on the first core value, Putting People First. When touring the new Benton County facility, they were shown how the facility was designed with the People First value in mind, ultimately creating a better environment for team members. Students also learned the value of maintenance and education. Simmons is proud to partner with the Career Academy of Siloam Springs. Click here to read more on the worthwhile partnership between Simmons and CASS.